Mother of all cool guns! Re: Mother of all cool guns! Was about $600 at cabelas, 800 retail but I have seen on sale for 400. Psh, that's cheaper than I've seen. $899 retail up here. Have you used it yet? Or is that going on the new project rifle? So, Bobby...being the calculating trained warrior NCO that you are. Take the appropriate action, Execute! Very nice Don, bot the pop gun and the scope. I was going to suggest the Vortex PST like I got, but that is a great looking scope. Yes for the new project gun. Have everything now but the gas tube, handguard and compensator. "The tree of liberty must be refreshed from time to time with the blood of patriots and tyrants"
I finally got to put some rounds through it for the first time today. Warmed it up with 40 odd rounds and the iron sights. Right out of the box it seems to hit what I line up on. Was shooting at a target about the size of a dinner plate at around 150 yards and was hitting it, firing from a bench. Up close I was smashing cinder blocks and flat Kentucky limestone rocks. It functions so smoothly and the added weight helps control the recoil to nearly that of a M4 firing military 70 gr stuff. That 308 will run a tad more to shoot. Anything under .50 a round and your are lucky. Instead of buying 1000 rounds at a time I have been buying in lots of 300 or 500! But I shoot less, savoring each and every shot. It's like it's just "More"
That's called relaxing and enjoying yourself. Unretired, sweeping floor at GLO once again & making coffee. Yep, you have 3x the bullet and I bet that shoots smooth! Well just had a bit of a strange lunch our. I walk into our local pawn shop looking for .22 ammo since all of the major chain stores are out. Must be a local shortage or something strange. Of course they are also out of .22. But up on the wall I notice something strangely similar to the beginning of this thread. Sure enough as I look it over closer, Sig Sauer 716, 16", 7.62. It has a couple tiny scratches from being handled but appeared to never have been fired. So I start asking questions. The pawn store has lots of guns but mostly used. They are an FFL dealer but don't sell many new guns because the profit margin is slim compared to the bigger stores around here. 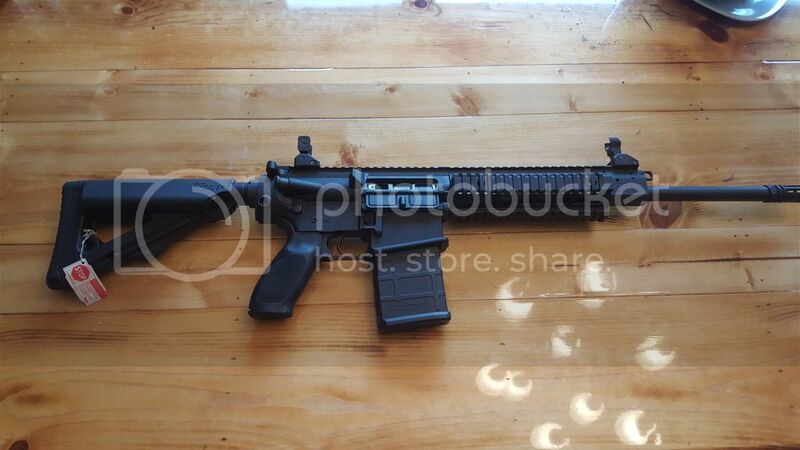 Apparently someone either special ordered or purchased this 716 online and had it sent to this FFL dealer for pickup. In between, he ran out of money and couldn't complete the transaction. So the pawn shop ended up with it. They have had it for several months, but since they are basically located in an "inexpensive" part of town, no one around here has the cash to take it home. The gun is brand new, except for being handled and on the shelf for a while. They had the original box, original paperwork and one magazine that go with it. He assured me, the original warranty would still apply, though I forgot to ask exactly how long it is for. So I was sort of half serious and threw out a really low ball offer for the heck of it. After some haggling, I paid $1900 plus tax and I pick it up tomorrow. Good deal or no? A couple questions for the experts, this one did not come with a sling - was that optional from the factory or did someone lose it along the way? I can have them look around a little closer if it was supposed to come with one. I just wanted to know for sure before I ask about it. 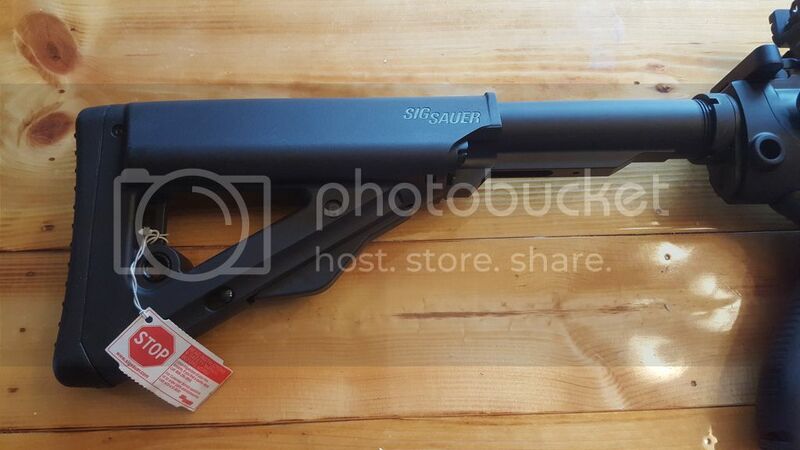 Also the adjustable stock is a slightly different design than the pictures of Don's. The release is under it instead of in the middle. Again is that an optional component, or is mine possibly a couple years old? Price sounds pretty good. Kat spent just over 2K for mine. 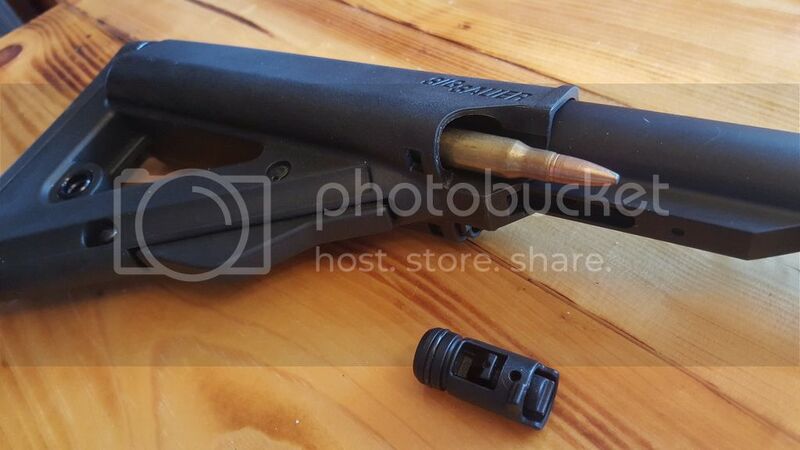 Only one stock, so I wonder if someone swapped it out for some Mag-Pul piece or something. You will just love how smooth that gun is. You won't want to go back to the small stuff...I know I don't! I love mine. It's THE perfect gun! Did you get your scope? With the supplied low rings you cannot fit it with the rear sight installed. I wanted a QD mount anyway, so I thought I'd explore options for a medium height QD. 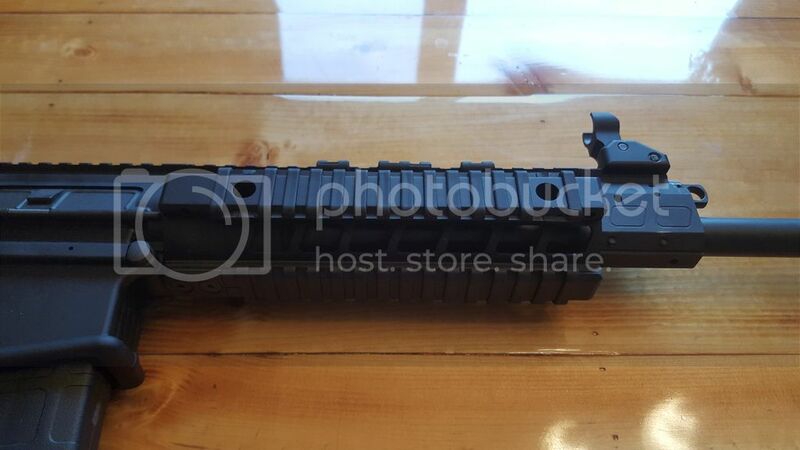 I'm wondering if I will be able to run iron sights at all, and in the case of the ones on this Sig, I really like them. I was able to bust up some old dinner plates at 100 to around 130-140 yards with just those sights. The gun is completely useful at those ranges as delivered. But I'll get that scope on. Pictures or it didn't happen, right? The stock is different from yours, but works just the same. Date of manufacture was Jan 2014. So it has been in the box for 2 years. They must have changed the stock last year. I modified the rail protectors so the sling can actually mount. The stock has two removable plugs. Inside it is open with a spring. The diameter is larger than a 308 shell. Any idea what is intended to be stored there? I could fit one shell in each side and almost but not quite two shells. So that is obviously not the intent. I store a miniaturized copy of both BATF stamps (SBR and suppressor) in mine so that they are always with the weapon. I use a Burris PEPR QD mount for the Leopold on my AR. Check that one as well. Well it took 9 tries over 2 days, but I was finally able to be put into the Sig Sauer customer support phone waiting line with only 1 person ahead of me. All the other times ranged from 6 people to apparently too many to list because a number wasn't given. Their website even admits that this is a common issue, so they must not have many people answering phones. The good news however, is that once connected to a real human, he was really easy to deal with. Once he verified my purchase, he said it was no problem and will send me a sling. So I am pretty excited about that. Received the sling from Sig last night. You were right, it was worth the effort to get it. The quick release connectors work really well. Now I just need to figure out how to use it. Setting it up as a 3 point sling using the rear stock mount and the rear forend mount was fairly straightforward and works really well. But I bet it has other options available since there are other mounting points. I've seen/used the quick connects once. I fell in love with them. Short of throwing money away for the sake of ease of use, I'm trying not to buy them. I just don't want to wind up missing a digit or limb. I can sometimes get in a hurry to get results. So did you ever end up mounting that scope to the 716? If yes how'd it work for you? If no, well then disregard. Then took it off awaiting a better mount. Couldn't find a LT or ADM mount you liked? Here's another maker of some quality mounts, at least the various forums and etc I wander say so. I am up in the air about a QR on screw mount. I like the QR but will it hold 0 if removed? You get to use BUS then too. perfect 0 with a QD is an impossibiity. The question is what is your acceptable margin of error. I'm def comfortable with a QD optic as long as I always have BUS. Here's my stance on the QD vs. Fixed mounts. If you mark the spot where the QD goes, and return it to the EXACT spot, and torque it down to the same standards as before then you shouldn't have a super critical shift in shot placement. Could you have a slight shift, well yes. Is it going to be a huge 20 MOA shift.... no. Like TRN said it'll be some absurdly small difference. Fixed is fixed... what else can I say? I guess I always thought the purpose of the QD would be to get it off quickly in the event you broke your optic and were in a bad situation and needed to keep shooting. In that scenario I could care less about return to zero. I don't see myself spending more than I did for the gun to put an optic on it and then taking it off to shoot with the irons, unless Someone was shooting back at me and the glass was shattered or something. But I have no formal training so maybe I'm missing something? That's pretty much right on for most folks. The only time you would use it regularly is if you had multiple optics systems for that single weapon system. For instance, separate day and night specific optics. Some weapons storage racks do not accept certain optics, either. For instance, the M16 racks in my arms vault would not work with the CCO or ACOG mounted in the most common positions on an M4. So, to store the weapons, they had to be removed. My Soldiers all marked their optics positions with a white paint pen line from the optic mount to the receiver, so they could quickly line them up with their zeroed position. The thumbscrews on the mount also had a paint pen line on the screw and mount that lined up when tightened appropriately, to ensure that the conditions from zero were repeated. We had no issues with loss of zero doing this, but were only shooting out to 300m generally. On one of our flights up near the Syrian border, one aircraft took fire...FROM THE SYRIANS! The bullets struck a rotor blade, the fuselage and one of the gunners personal M4. His M4 was destroyed by the single AK round tearing it up. Had that been just the ACOG, then the weapon could have still been used accurately with BUIS. Oh I'm sure there's lots of ways to destroy an optic in those scenarios. Or leaning it up against something and it slides off and hits just right Murphy's law and all that. Although there is that video of Larry Vickers tossing a rifle with an Aimpoint out of a helicopter and it comes out unscathed. In the realm of normal civilian usage a fixed or QD would work out. It's a personal opinion type thing in my eyes. If you choose fixed, you have the option for the off set sights. While there are some fixed mounts that can be taken off in 10 seconds or so, never seen or messed with them so no personal experience. I've used QD when I was in the Army, never had a problem with the zero being off. But then again, I marked where they went and re-torqued to the previously used standards. I understand you don't get zero with QD, opinions is what I wanted and got. I don't think there are QD options for one of those.